On the Labour Day long weekend in March, Tim and I stayed for three days in Bendigo. We have been to Bendigo a number of times before, as it is an easy 2 hour train ride from Melbourne, and just has a vibe that we love. My photos are a little eclectic because I have photos of the usual touristy things from other visits. Some of these photos come from our walking tour with Jill and Pete, two fabulous local guides; others come from our ramblings through Bendigo during our stay. 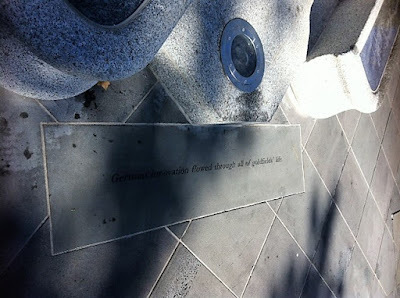 I hope that you enjoy these photos for a little taste of Bendigo. The Bendigo bats are well travelled - scientists tagged three bats that they dubbed Byron, Bradley and Borat to track their travels. All of them flew for miles, and Byron and Bradley returned to Rosalind Park after their adventures. Sadly, Borat flew to the Blue Mountains in NSW then dropped off the map. Rosalind Park features statues of Queen Victoria and her son, Prince Alfred, who made a rather ill-fated visit to Bendigo for the Easter Parade in 1867, when one of the floats caught fire. I enjoyed the connection between Queen Victoria's family and Bendigo, as at the time, I was ensconsed in watching the ITV series, Victoria, starring Jenna Coleman. It was wonderful to experience such diversity of experiences while in Bendigo.